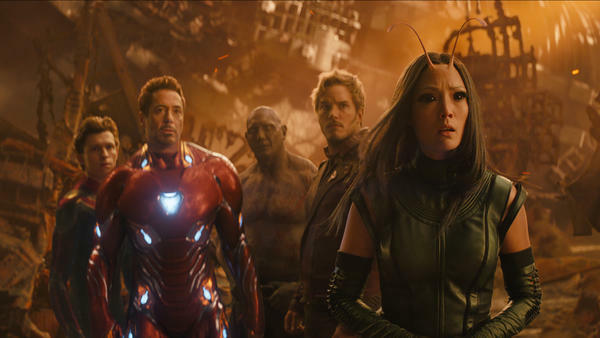 L to R: Spider-Man/Peter Parker (Tom Holland), Iron Man/Tony Stark (Robert Downey Jr.), Drax (Dave Bautista), Star-Lord/Peter Quill (Chris Pratt) and Mantis (Pom Klementieff). She warns the heroes that should Thanos collect all six cosmically powered gems called the Infinity Stones, he'll be able to accomplish his goal: To wipe out half of the overcrowded universe's population with a snap of his fingers. Eco-terrorism on a galactic scale. Well, that's the story in Marvel's own ... call it Ocean's 28 ... and I'm honor-bound not to spoil it. I can say that our heroes have their work cut out for them: Not just battling Thanos and his metal-gray hench-folk, but also explaining things like those all-powerful Infinity Stones so you'll know why folks are throwing asteroid-sized objects at one another. Robert Downey Jr's Iron Man and Benedict Cumberbatch's Doctor Strange handle most of the expository heavy lifting. The three Chris-es ... Evans, Hemsworth and Pratt ... are present and accounted for, with Evans' Captain America doing his decent soldier thing, while the others, intergalactic pretty-boys Thor and Star-Lord, puff out their chests amusingly. To leave no Stone unturned, as it were, the film travels to Greenwich Village, Scotland, a planet called Knowhere (as in "I know where they've hidden the Stones") and also to Wakanda — which got the biggest cheer at my screening — with Black Panther having the honor of hosting the Earth version of the Apocalypse. Central to all this is Josh Brolin's wistfully misguided, persuasively villainous villain, conducting a galaxy-crushing scavenger hunt for the stones that will give him one Beadazzled glove to rule them all. Infinity War's place in the Avengers saga is much like that of the middle chapters in the Lord of the Rings and Star Wars: It's chief purpose is to leave you hungry for next summer's finale. And that much, it does ... not so much with inspiration, as with the well-oiled efficiency we've come to expect from Marvel. The Marvel movie "Avengers: Infinity War" opens this weekend. Advance ticket sales are topping even those for "Black Panther." The film brings together storylines from all over the Marvel Universe, and it's being advertised with a certain finality. JOSH BROLIN: (As Thanos) The end is near. SHAPIRO: That's the villain talking. And critic Bob Mondello says he is in a way talking about the series itself. BOB MONDELLO, BYLINE: The Avengers are forever saving the world. They've done that in three movies, countless comic books. But this time, they're up against a big guy named Thanos, and it's not just the world that's in danger, at least according to Thanos' estranged daughter. ZOE SALDANA: (As Gamora) The entire time I knew him, he only ever had one goal - to wipe out half the universe. If he gets all the infinity stones, he can do it with a snap of his fingers, just like that. ROBERT DOWNEY JR: (As Iron Man) We're going to need some help. MONDELLO: Some help is soon on the way. And by that, I mean so many superheroes and hangers-on from every nook and cranny of the Marvel Cinematic Universe that the only way I can fit them all into this review is to tap into my own admittedly minor super power and release my inner-Gilbert and Sullivan. MONDELLO: (Singing) Hulk and Thor and Cap and Loki, Pepper Potts and Iron Man, Black Widow, Heimdall, Bucky Barnes and teen web-slinging Spider-Man. From "Guardians" there's Rocket, Groot and big-eyed Drax the Destroyer plus Star-Lord and Gamora and her cyborg sibling Nebula. Wakanda's sending T'Challa, who is Black Panther, as you know, along with brilliant Shuri, Okoye, M'Baku and Ayo. The Scarlet Witch and Mantis will be joined by Dr. Strange and Wong plus Falcon, War Machine and Vision. Man, this list is getting long. MONDELLO: But will they be enough? Well, that's the story in Marvel's, shall we say, "Ocean's 28." And I'm honor-bound not to spoil it. I can say that our heroes have their work cut out for them not just battling Thanos and his metal-gray henchfolk but also explaining things like infinity stones so you'll know why folks are throwing asteroid-sized objects at one another. Robert Downey Jr.'s Iron Man and Benedict Cumberbatch's Dr. Strange do the expository heavy lifting. BENEDICT CUMBERBATCH: (As Dr. Stephen Strange) He could destroy life on a scale hitherto undreamt of. DOWNEY JR: (As Iron Man) Did you seriously just say hitherto undreamt of? MONDELLO: Speaking of Downey and Cumberbatch or, rather, of their screen lives elsewhere, I remember finding a volume of the complete "Sherlock Holmes" when I was a kid and sitting down to gorge on the stories all at once and realizing as I got to the 11th or so that I'd learned the rhythms and wasn't being surprised anymore. We are now at number 19 in the Marvel movies. I say this simply as an aside. CUMBERBATCH: (As Dr. Stephen Strange) Went forward in time to see all the possible outcomes. DOWNEY JR: (As Iron Man) Did we win any? CHRIS HEMSWORTH: (As Thor) Join us. MONDELLO: ...Puff out their chests amusingly. HEMSWORTH: (As Thor) Join Earth's mightiest heroes. CHRIS PRATT: (As Star-Lord) Not today, Sir. BRADLEY COOPER: (As Rocket) Are you making your voice deeper? DAVE BAUTISTA: (As Drax) You are. POM KLEMENTIEFF: (As Mantis) He just did it again. BAUTISTA: (As Drax) You're imitating the god man. PRATT: (As Star-Lord) This is my voice. MONDELLO: Give credit to directors Joe and Anthony Russo for keeping storylines straight and for impressive crowd control despite some understandable overlap in costumes and superpowers when you cram this many heroes into one movie. It's mostly possible to tell who's doing what to whom even if the filmmakers lay on too many climactic battles that aren't actual climaxes. To leave no stone unturned as it were, the film travels to Greenwich Village, Scotland, a planet called Knowhere, as in, I know where they've hidden the stones - also to Wakanda, which got the biggest cheer at my screening with Black Panther having the honor of hosting the Earth version of the apocalypse. DANAI GURIRA: (As Okoye) When you said we were going to open Wakanda to the rest of the world, this is not what I imagined. CHADWICK BOSEMAN: (As Black Panther) What did you imagine? GURIRA: (As Okoye) The Olympics, maybe even a Starbucks. MONDELLO: Central to all this is Josh Brolin's wistfully misguided, persuasively villainous villain conducting a galaxy-crushing scavenger hunt for the stones that will give him one bedazzled glove to rule them all. BROLIN: (As Thanos) This (laughter) does put a smile on my face. MONDELLO: "Infinity War's" place in the "Avengers" saga is much like that of the middle chapters in "The Lord Of The Rings" or "Star Wars" trilogies. Its chief purpose is to leave you hungry for the finale, and it does that not so much with inspiration as with the well-oiled efficiency we've come to expect from Marvel. I'm Bob Mondello. Transcript provided by NPR, Copyright NPR.